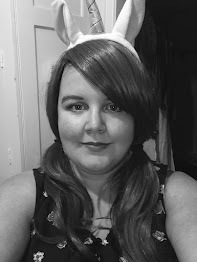 As you know, this week I am celebrating Kat's Beauty Reviews' first birthday, and I really wanted to do something that said "Thank You" for all of the support and love you've all given my blog over the past twelve months, because I honestly appreciate every single on of you guys. Without you, I would not be here. To say thank you, I'm going to be running two giveaways over the course of this week, and today I'm bringing you the first one, for which I am honoured to have teamed up with the lovely Emma, from Jiji Kiki. "A tiny, delicate silver plated star necklace. Perfect to add simple chicness to your outfit and sure to become a new favourite. 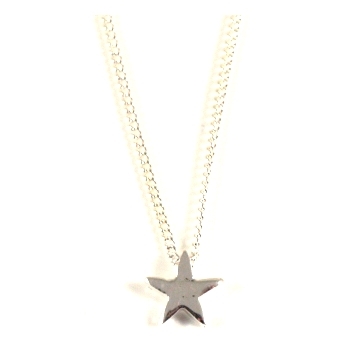 This lovely little star measures just 1 cm across and is strung on a fine, silver plated 18" chain." Specially picked for you, by Emma, this is a really adorable, but simple piece that proves that simplicity can make a very big statement. "Sweet gingerbread man or lady earrings. Gingerbread brown with black detailing-the lady has a dress and the man a little bow tie. Measure 2 cm tall, on silver plated studs with butterfly backs. Price per pair, choose from matching pairs of men or women or a mixed pair of one of each! Handmade by Ji Ji Kiki." This prize was especially chosen for this Giveaway by me, so you know that this is a piece that I love. I am a huge, huge fan of quirky pieces and fell in love with these little characters from the moment that I saw them. Both of these items could be yours, if you are the lucky winner of my first ever Giveaway. 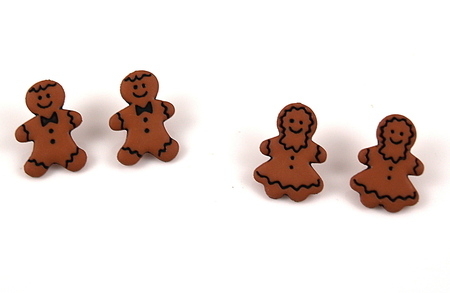 And, the winner will get to choose which Gingerbread earrings they want: Either Male, Female or a Mixed Pair. Open to anyone, in any country, that is covered under Jiji Kiki's Delivery Terms (please check if you are unsure). The point of this Giveaway is to thank my followers, so to enter you must be a follower of my blog (and yes, I will check). All you need to do, is leave a comment below, stating whether you would like the Male, Female or Mixed earrings, including your email address or Twitter details. Feel free to re-tweet this Giveaway, making sure that you mention me (KittyFairy) in your tweet. Giveaway is open until 12 noon Monday 18th April.